. : Arr... Harty, Harr, Harr....Our First Boy is Five! Arr... Harty, Harr, Harr....Our First Boy is Five! 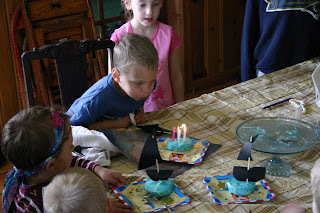 Our second child, and first son, requested a pirate birthday party and for Mama to make eye patches for his friends, "and a new sword please, cause Bear chewed mine up". I had a brilliant idea on how to make a treasure chest cake, which fell through. So his big siter and I made little piratey-looking ships a-sailing on the sea. 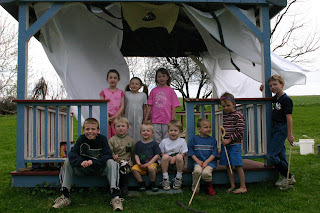 The afore mentioned gazebo, decked out on white sheets for sails and a not very clear pirate flag that reads, "Happy Birthday ______". Andrew is in the blue shirt, holding his sword. His best friend standing to the right, is also a fan of swords and brought his along for the party. Needless to say, the three girls hovering in the back row were prey to pirate attacks and kidnapped baby dolls all afternoon.